Primary Immunodeficiency UK marked World PI Week with the launch of new condition specific booklets. Covering CVID, Hyper E Syndrome, IgG subclass deficiency, Selective IgA deficiency, Wiskott Aldrich Syndrome and XLA they provide up to date information on diagnosis and treatment. The booklets will be available to patients through their immunology centre and in a digital format on the PID UK website. 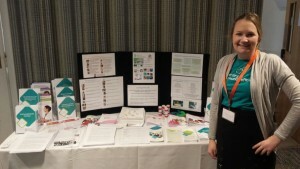 PID UK raised awareness of these new resources to the nursing community at their display stand at a recent UK Immunology and Allergy Nursing Group conference where they proved popular. PID UK also recently received a grant from the Jeffrey Modell Foundation to produce booklets on antibiotic use in PID and on immunoglobulin therapy, as well as emergency cards for patients to carry around with them so that they can produce them when they are visiting doctors during emergencies. These resources will be launched within the next couple of weeks.